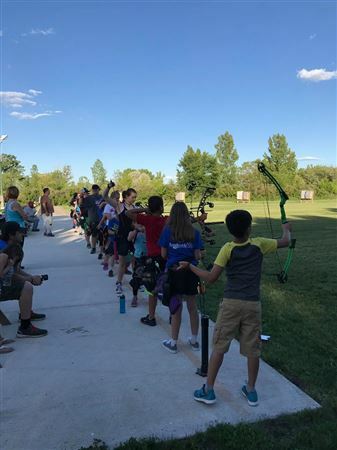 JOAD is Junior Olympic Archery Development for children ages 8 to 20. We require that you have either taken our beginning archery class or shoot a qualifying score at 9 meters to participate in JOAD. There is a cost for JOAD. The cost can vary depending on how many kids participating in the session. You will also need to belong to USA Archery to obtain the pins that can be earned in this program. This is a great program if you are looking to excel in your archery career and to develop great shooting skills. This is a development program and is a process, but very rewarding for your archery development! Sandhills is changing up their current format for their JOAD Team starting the winter of 2019. JOAD will be administered by Level II or higher USA Certified Instructors. JOAD moves from a recreational shooter to an intermediate-advanced level shooter interested in competition. We will delve deeper into the Steps of Shooting focusing on different steps each session with practice through specific skills and drills. We will work on affirmations, mental management, journaling and distraction training. There will also be some equipment setup/repair instruction. As the archer progresses, they will have the opportunity to shoot for predetermined scores based on a matrix set forth by USA Archery. Once they achieve a specific score, they will earn a pin to place on a lanyard that can be worn on their hip quiver. Once they have achieved all their lanyard pins, they will have the opportunity to shoot for their bronze, silver and gold Olympian Pins. A Beginner Archery course is required for JOAD and the archer must have their own equipment. The archer must also hold a current USA Archery, NFAA or ASA membership to participate. **All USA Archery Youth programs are designed for ages 8-20.